Brilliant! I updated to iOS 9 just for this. The practical part of this for me is that sometimes I get tongue tied when I set reminders up via Siri. Now if you already have your task in WorkFlowy (since each list has it’s own URL – Amazing!) you don’t need to mention exactly what you need to be reminded about. Also, of course, Siri doesn’t do mixes of languages – which is often what my WorkFlowy tasks are comprised of. Now I’m free to be me, haha! Then there’s the whole benefit of one’s tasks containing other pertinent info. or even nested URLs to follow – access to all the outliner goodness we’re accustomed to. To build a better case, one could use the incredible cross-platform app, Sunrise Calendar, which pulls in events from Google Calendar, iOS Calendar, Trello, Evernote reminders (and hundreds of other apps)… and… …iOS Reminders. So you can see your iOS/ WorkFlowy reminders plotted out spatially on one consolidated calendar with the rest of your stuff. 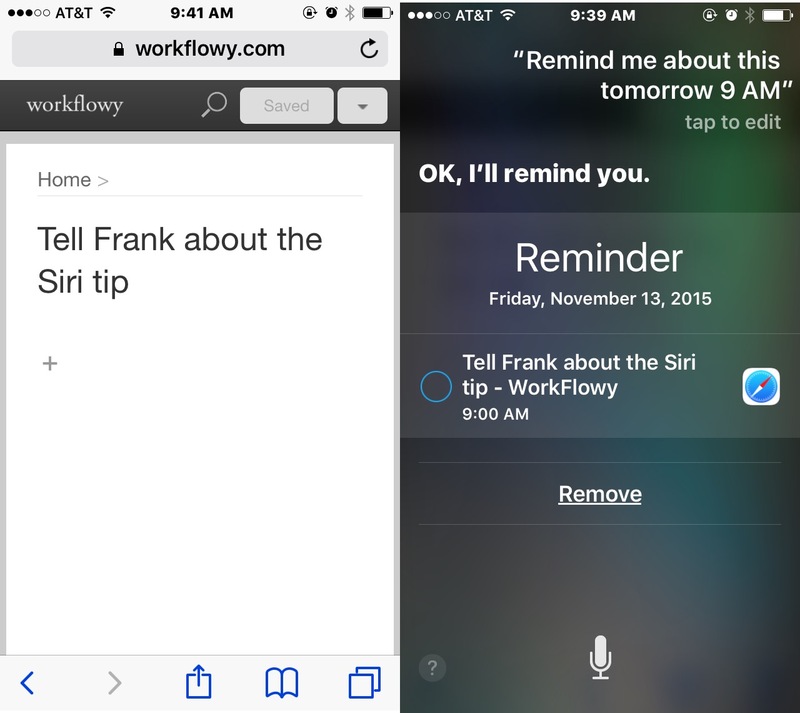 I do this already… but now WorkFlowy/ iOS reminders is the cherry on top! Just zoom into each task one at a time and tell Siri to remind you about each of them at whatever time or date… and they appear in Sunrise Calendar. Those will automatically go into my Sunrise Calendar too 🙂 and you’ll see them repeated. One could have a dedicated list in WorkFlowy for recurring iOS reminders set up – or tag them (or not). This could be used for “Don’t break the chain!” habits… you could go to town on this. All great ideas, Frank! Regarding the iPhone, if you have a 4S, some iOS 9 features are disabled. This works in Android too, except it only adds the URL so you’ll have to do some manual edidting to make sense of the reminders.